Today at the Delcam ATS we sat through a number of product presentations. One of them was about PowerShape given by Vineet Seth, Delcam’s Country Manager for India. Here is one slide of the presentation that peaked my interest. 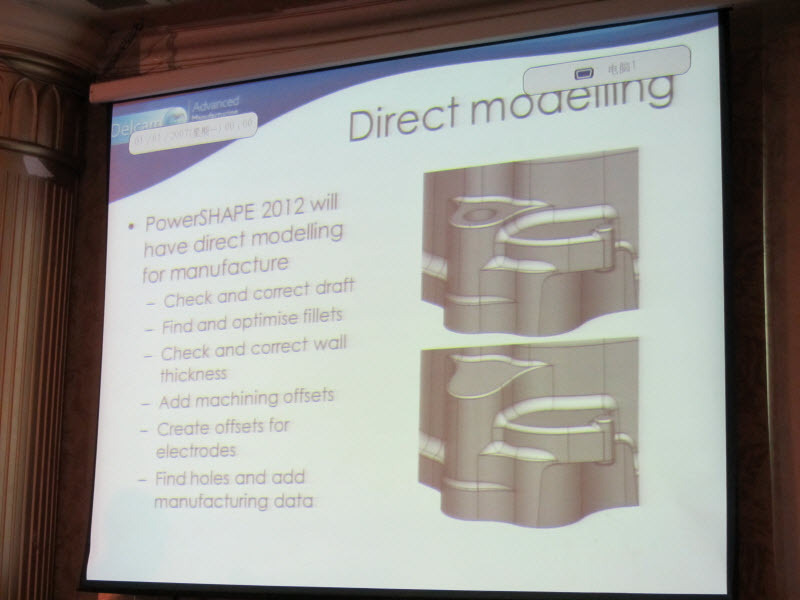 PowerShape 2012 is going to have “direct modeling for manufacture”. PowerShape is a powerful MCAD system in its own right. But unfortunately Delcam doesn’t do a good job promoting it as one. And they admit it as well. Instead their marketing is focused mainly on PowerMill, their flagship CAM solution. Actually Delcam promotes PowerShape as a CAD system that is supposed to take data from other MCAD systems and then make modifications for manufacturing purposes. So if it is destined to sit between an MCAD system and a CAM system like PowerMill then direct modeling will be very useful. I look forward to taking PowerShape 2012 for a spin.